Sanitaire ergonomic commercial backpack vacuums are designed to clean more area in less time for healthcare, education, hotel, food service, government and industrial cleaning. 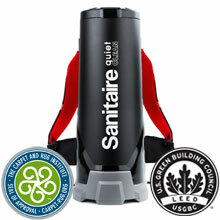 All Sanitaire backpack vacuums are LEED compliant. Leadership in Energy and Environmental Design (LEED) is the nationally accepted benchmark for the design, construction and operation of high performance green cleaning.